For the first several years of our tours around Lake Superior we were tent camping and stayed at an occasional motel for variety or when inclement weather materially reduced the "pleasures" of tenting! Since 2005 most of our trips have been made in our newly acquired RV, a Winnebago Rialta. So we are acquainted with both styles of camping. Below we've organized our camping links according to seven regions around Lake Superior. Clicking on the heading will take you to the detailed links and info page for each region. 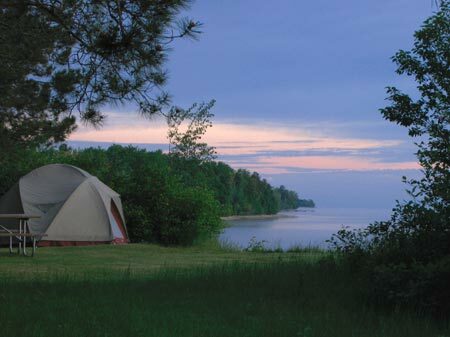 Our Lake Superior campground reviews & camping recommendations here span our experience canoe and tent camping in the wild's of Ontario, camping in the relative comforts of an established campground, and camping in, what to us - as life long tent campers - the luxury of a motor home. So we try to cover noteworthy campgrounds in all categories from more primitive to modern. Our profiled campgrounds include village parks, county parks, state parks, national parks and national forest campgrounds, and a few privately operated campgrounds. Most of what we profile here will be parks we've personally camped at and feel comfortable recommending. 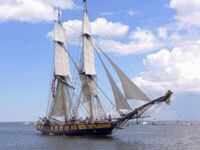 A number offer scenic and recreational amenities that make them suitable for a day visit . . . even if you're not a camper or planning to stay overnight. There are several nice campgrounds in the Bayfield-Ashland area. (see Bayfield Camping Reviews here). For tent campers who want showers and flush toilets, we like the two lakeshore municipal campgrounds in Washburn, Wisconsin. Note to RV users, we recently discovered Washburn's West End Campground has an excellent free Wi-Fi service. Jo's favorite RV Park in the area is Ashland's Krehler Park. All sites have views of the lake, level parking pads with a decent bed of gravel, paved roads thru the park, and well-maintained. About 20 miles south of Ashland is Copper Falls State Park - nice hiking trails, swimming beach, washrooms, and campsites. Two nice full service campgrounds exist on Madeline Island: Big Bay State Park & Big Bay Town Park. For Campgrounds near Superior, Wisconsin . . . Amnicon Falls State Park is a nice little park with spacious campsites, attractive waterfalls and hiking trails, but the washroom facilities are rustic and no RV facilities. 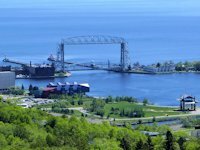 Those who want more amenities should look at Pattison State Park (south of Superior on Highway 35) or cross the border into Duluth and check out Indian Point or Spirit Mountain municipal campgrounds. For Campgrounds near Hurley, Wisconsin . . .try Saxon Harbor off of Wisconsin State Highway 122 or Little Girls Point, Michigan 505 (which is what Wisconsin 122 turns into when it crosses the border at the Montreal River). Several top notch campgrounds along the north shore are associated with the North Shore Minnesota State Parks. 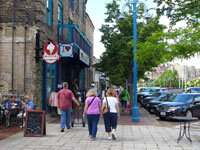 Their hiking trails, scenery and recreational amenities make them a popular destination. For tent camping, our favorite is Split Rock State Park. In the peak season (June - September), reservations are recommended at most of the parks south of Grand Marais. You'll have a little better luck getting into Cascade River and Judge Magney w/o reservations. 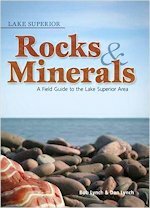 Andy Slade offers detailed info on several public and private camping sites along Minnesota's North Shore of Lake Superior. There are some national forest campgrounds away from the lake a few miles. Most are tent sites with vault toilets but some have adequate space for RVs willing to dry camp. 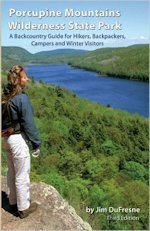 Andrew Slade's book on Camping the North Shore is an excellent detailed reference for both public and private campgrounds along or near the Minnesota North Shore of Lake Superior. 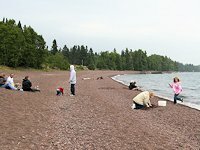 Two municipal lakeside campgrounds with showers and flush toilets we like are at Two Harbors and Grand Marais. Two Harbor's Burlington Bay Campground is at the north edge of the city and has a nice swimming beach plus a decent rock picking beach for Rock Hounds. It is also within walking distance of downtown and convenient to the Sonju Lakewalk. The Grand Marais municipal facility rates are the highest you'll find at municipal RV parks around Lake Superior. But if you are willing to spend a few dollars over average its location on the harbor and close to downtown can't be beat. 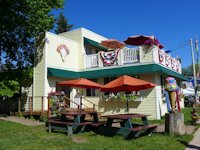 If you are on a budget, the RV park at Grand Portage is a good choice for an overnight stay at about $10 less than Grand Marais. In Duluth, the municipal campground (Indian Point Campground) is on the St. Louis river, has 70 spacious sites, from tent to full-hook-ups. Rates are reasonable. A second city-owned campground is located at the top of Spirit Mountain. It has a number of wooded tent sites as well as RV sites suitable for smaller units. 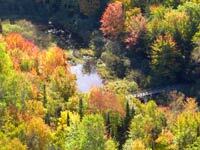 The Spirit Mountain campground is a nice location for hiking the Duluth section of the Superior Hiking Trail. Two reasonably priced campgrounds we like in the Western UP are Little Girls Point and Black River Harbor. Neither has showers, but they do have flush toilets and RV dump sites. Porcupine Mountains State Park has both rustic and modern campgrounds; a good choice if you enjoy hiking, biking and/or outstanding scenic views. The main camping choices in the Keweenaw Peninsula are three state parks. FJ McClain near Hancock and Ft Wilkens in Copper Harbor are good choices, but also the most expensive. Most of the camping facilities in the Central UP are rustic or semi-modern. In this group, we like the Bay Furnace National Forest facility for either tent camping or RV use. Most of the Pictured Rocks campgrounds are rustic and primarily for tenting. Those wanting showers and modern facilities should look at the Munising Tourist Campground. In the Eastern UP, for rustic campgrounds, we like those in Pictured Rocks. Although more expensive, the campground at Tahquamenon Falls is a good choice if you have time to enjoy the recreational amenities. 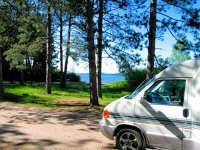 We believe the best value, for both tent and RV camping with showers, is the Grand Marais municipal campground on the shores of Lake Superior. 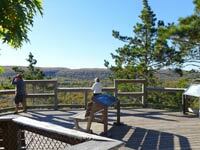 Our favorite campground in Western Ontario is the one at Sleeping Giant Provincial Park. If your main interest is a decent spot for an overnight stay, we found the KOA campground north of Thunder Bay quite well maintained - 5 stars for their washroom-shower facility. There are several nice campgrounds along the Eastern Ontario portion of the Lake Superior Circle Tour. Our favorite is the Hattie Cove campground of Pukaskwa National Park. A good value for a campground with showers is the Lions Club Camp at Pointe Des Chenes near Sault Ste. Marie. coming to Duluth in August 2016. 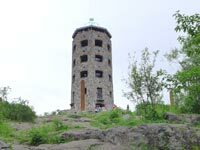 Duluth's Enger Park Tower provides a panoramic view of the city of Duluth.